Set within in Butler’s Wharf, an old Victorian shipping warehouse, when Le Pont de la Tour first opened its doors, it quickly became something of a destination restaurant thanks to its prime riverfront location, adjacent to Tower Bridge, in a previously unsung part of town. Now, nearly a quarter of a century later, the eatery is once again ready to fly its flag high and proud after an overhaul by local interiors outfit, Russell Sage Studio and the addition of hot new chef, Frederick Forster. 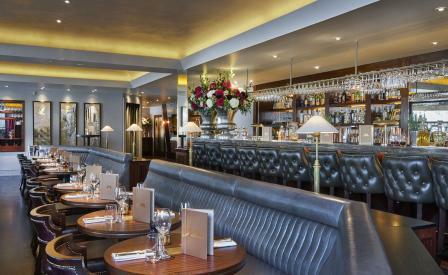 Styled to resemble the French ocean liner, SS Normandie, the entrance – now a slick bar that serves a casual menu of hors d’oeuvres and sharing plates – leads to the lavish restaurant, which has been smartened up with Art Deco furnishings and deep leather banquettes in rich burgundies with hints of opulent gold. Food is a typical French affair, with an unfussy menu, featuring classics from Dover sole to tarte tatin. Wafer thin smoked salmon is expertly sliced; the beef is juicy, while the crêpes Suzette – flambéed at a central station – creates just the right amount of drama.